Estonia´s President Toomas Hendrik Ilves painted a grim picture of the security challenges of Europe during his one day state visit to Norway as the guest of King Harald and Queen Sonja. 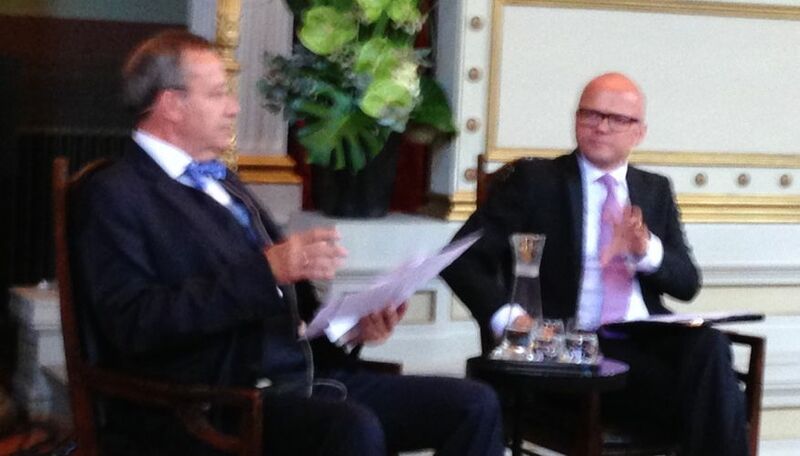 Estonia´s President Toomas Hendrik Ilves and Norwegan Europe Minister Vidar Helgesen answering questions. ECAL Convenor Jan-Aage Torp was among 150 guests at a Europe Lecture where the Estonian President stated: - If we do not make it clear to Russia that they have done something which is both unacceptable and illegal, then we may end up with more serious conflicts in the future. We cannot allow that Europe again be divided into different interest spheres, said Toomas Hendrik Ilves, Estonia´s President. When Jan-Aage Torp asked President Ilves, who is a former member of the European Parliament and a former Foreign Minister of Estonia, about his perception of the threat of islamic destabilization of Europe, President Ilves candidly expressed his concerns: - I believe that the islamic challenge could become equally serious for Europe, he maintained. -Although it is not yet a challenge for Estonia where even the Jewish synagogue lives a peaceful life with no need for special security arrangements.